Managing the hardware and software that enable the connections, communications and operations within your IT ecosystem so everything flows smoothly is what Network Infrastructure Management is all about. With smooth-flowing IT comes the ability for your team to work uninterrupted. No bottlenecks, speed bumps or traffic jams. No getting stuck behind a slow-moving “bus” or waiting for an intersection to clear. Unmanaged or mismanaged networks create traffic problems. Our network management experts focus on getting your information packets where they need to go as quickly as possible. This means we fix things when they break, but more importantly, we take all kinds of proactive actions to keep things from breaking in the first place. With Network Management from Leapfrog, our frogs are responsible for managing your systems, components and Internet carrier — the three parts that make up your network. It starts with bringing your network up to par, if it’s not already, so we can manage it successfully and so you can be happy with its performance. Once your network is optimized, we continually monitor your all of your networks — local, wireless, and the connectivity between your business locations, known as LAN, WLAN and WAN — and when there are issues, we hop on them and resolve them quickly. But we don’t just respond to problems. We prevent them. Managing proactively means we can deliver as close to uninterrupted operations as possible — we’re talking 99.999% here. For example, if someone on your team lets us know that a task is taking longer than usual, we’ll investigate and find the root cause, no matter where it’s located. This is possible because our Network Management service includes managing all the switches that facilitate communication within your network plus managing all of your firewalls, routers, remote access support (including VPNs), and prioritization policies. It’s all centralized — we see and manage everything. It’s the best way to locate and fix problems and for you to get the best IT. We also monitor and manage your Internet connection. We make sure your Internet is up, running and delivering the speed and throughput that you’re paying for. If it’s not, we hop on it like a hungry frog on a lazy fly. With Leapfrog’s Network Management, your team no longer has to deal with solving Internet connectivity issues. Or any network issues. At all. We do it for you. Errors happen. Disks fail. Hardware wears down. Just like things eventually wear down on your car — it’s part of owning a car. And just like on your car, if you have advanced systems that warn you something’s not quite right, you can take care of it before your car leaves you stranded. Leapfrog’s Server and Storage Management includes regular evaluations, monitoring and the resolution of any issue that may affect your servers and Storage Area Network (SAN). This includes handling errors, processor availability, memory partition availability, physical or logical disk failure, thermal sensor monitoring, cooling system operation, power supply operation, key performance metrics, data traffic, fiber link performance and other IT nuts and bolts. We use Simple Network Management Protocol (SNMP) enabled hardware, servers with management functionality that includes early detection systems, plus other integrated monitoring systems to detect potential problems and buy us some time to make repairs before real damage occurs — the same way your spare time buys you some time. With managed servers and storage devices, you can keep leaping forward without missing a beat. Your data is like the lifeblood of your business. It’s what makes your business your business — so it needs to be accurate, consistent, backed up, stored properly and available to the right people at the right time according to your specific policies. With Leapfrog Data Integrity Management, we make sure your data meets the threshold for performance across the board and is, quite frankly, gorgeous. Any corrupt data, backups of corrupt data or capacity issues that can lead to corrupt data will be spotted quickly and remedied. Worried about recovery problems due to data problems? We back up your data daily, verify that the backups execute properly, monitor your data growth trends so we can advise you about capacity requirements, remove temp files and other data you don’t need so we can recover disk space, and evaluate any errors and permission changes. Which means we perform all the tasks involved in a comprehensive approach to getting data right. We don’t want you to think about the bits and bytes. We want you to think about how you can use what they represent to improve and grow your business. For your business operations to function correctly, the Operating System (OS) that runs on your servers has to function correctly. All day, every day. It’s your platform — your business apps depend on it! So managing your OS is a high-risk responsibility. Any problems or changes to the OS can have a major impact across your business and all of your departments. Patches, fixes, anti-virus (anti-malware), service packs and reboots on any of your servers — which can include application servers, proxy servers, mail servers, web servers and others — need to be handled with extreme precision at the most appropriate time of day. 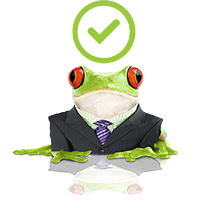 Our frogs are experienced professionals who manage hundreds of servers, using a proven, systematic approach that keeps your OS leaping along as it should. We handle all of the updates plus all of the proactive and preventative maintenance tasks that you need to have an optimized IT environment. This includes monitoring and troubleshooting problems, cleaning up disk space, looking through logs to spot anomalies, identifying runaway processes that are taking up too much memory and other activities. Leapfrog OS Management for Servers means your platform will be the lean, mean, operating machine that your business needs to conquer the day, every day. Are your workstations healthy and problem-free? Do your desktops and laptops have the latest patches, fixes, anti-malware and service packs? Are error messages being resolved quickly? Are critical updates being loaded right away and are less critical updates being bundled into a single load to keep your team as productive as possible? The answer should be yes, yes, yes and yes! End-Point Management from Leapfrog can make it so. You get the same complete Operating Systems (OS) management services as OS Management for Servers (above) except they’re applied to your workstations. We perform most of the work remotely, using sophisticated tools designed to keep the OS on computers current and problem-free. In addition to patching and updating the OS, our frogs manage the anti-virus (anti-malware) protection on each device and remove anything the OS doesn’t need so the device can operate as smoothly as possible. If we’ve optimized the OS but a device still isn’t performing as it should, our frogs will rebuild the OS or handle the hardware repair process with the manufacturer on your behalf — backing up all the data first, of course. Your team doesn’t need to be involved because your team needs to work, on computers that work. That’s why Leapfrog offers End-Point Management along with all of our other Network Infrastructure Management services. Network Infrastructure Management from Leapfrog can give you the IT operational excellence you need to leap over your loftiest business goals. So go ahead. Set the bar even higher.